It never fails to amaze me at the lengths people will go to get something that doesn’t belong to them. How these people sleep at night is beyond me. But sure as the sun rises in the east, if there is a way for a scammer to get your money, be it real life dollars or Linden dollars, they will do it. Strawberry Singh recently blogged about a scam (that’s a clickable link) that is going around SL right now called the Giftbot Discount Scam. Because people have received this object that is supposedly for the store where they just landed, they trust the object and accept without really reading. Too late, they realize that the bot script has stolen all their lindens. Every content creator tries to make sure their customers have a pleasant shopping experience and their sim is a safe place to shop. These kinds of things can make that difficult. “Unfortunately there is not much the content creators can do aside from letting Linden Lab know about the account and banning it from their sim. However, . . . it’s futile since these are bots and a new one is created by the culprits within minutes to replace the banned one. 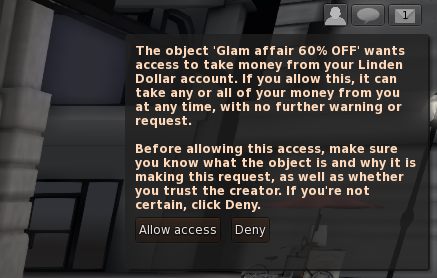 • Deny/Delete Object: Immediately deny or delete object without attaching, rezzing or wearing from your inventory. • Report: File an Abuse Report against that resident/bot right away to make Linden Lab aware of it so they can take the appropriate action. • Block: Block/Mute that avatar/bot right away. • Inform Sim Owner: It might be a good idea to also let the sim owner know, even though they cannot do much else but ban from the sim. “Most of these bots that you may encounter on popular sims will be named ‘shopsdiscount’ or ‘giftbot’ or something similar. So if you encounter an avatar like that, especially if they are only a few days old, please don’t accept anything from them. However, be aware that the names change frequently, it’s not really the name of the avatar that matters. What matters is the entire idea about this discount/free gift scam that you need to be aware of , watch out for and also tell your friends and family about. We don’t need more people losing money to these scammers. • If you are a shopper, certain vendors that have shop at home HUDs sometimes require access. • If you are a merchant and setup a certain type of vendor, you may need to give access for various reasons such as: to give refunds to your customers in certain situations. • For a vendor at an event or rental sharing percentage with landlord. • For different charity or partnership vendors. There are certain legitimate situations where this kind of script for giving access to your lindens is acceptable. Just keep in mind that these scams are out there, and if you do not 100% know what the thing is and where it came from, and are not entirely certain it is legit: DO NOT ALLOW! It’s just not worth the risk! When in doubt, throw it out! I hope this raises your awareness of this latest scam. We all need to watch out for one another and pass this information along so that hopefully these scammers will no longer have victims in Second Life. Posted in HINTS & TIPS. Tagged giftbot scams, Second Life, Strawberry Singh, ZoHa Islands.